Martin McDonagh’s 1996 play “The Beauty Queen of Leenane” has lost none of its theatrical punch or its dark poetic power. The title might suggest a gentle Irish story of homespun lore, but this is McDonagh at his most caustic, as he stealthily confronts a destructive family relationship featuring morbid guilt, dangerous delusion, acute loneliness and the blurred line of madness. 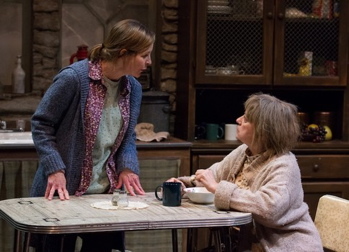 It is a complex and harrowing bit of theater and Lantern director Kathryn MacMillan orchestrates the familial mayhem, not to mention McDonagh’s poisonous wit, brilliantly. Maureen Folan has been taking care of her sickly and manipulative mother Mag for 20 years in a small town in County Galway, Ireland. Mag spends her days in a virtual daze, starring at the TV waiting for the six o’clock news, fussing about her tea and digestive tonic, which Maureen has to prepare to her strict instruction every time. Maureen bristles at her mother and gives as good as she gets, taunting her with obscenities and jokes about dumping her in a nursing home. Slowly the routine of their days exposes the core resentments each holds for each other and the sharpest stabs of abusive love. The outside world intrudes on them when the densely juvenile Ray Dooley trudges up their muddy and rocky path to deliver messages (since they don’t have a phone) with an invitation to his brother’s Pato’s (“Yank”) going-away party for their relatives leaving for Boston. The invitation is for Maureen, determinedly not for the sickly Mag. But Ray harbors a grudge against Maureen over a lost ball, so Mag easily fools him into spilling all the beans. Of course, Mag withholds the information from Maureen, who, but is instantly found out and thus McDonagh uncorks the long character study that bubbles up from the disintegration of the women’s relationship. The daughter goes to the party and starts a romance with Pato, but the intimacy dredges up insecurities that she herself thought were past, and now agitated by her mother, who feels threatened. The lyricism of McDonagh’s Irish dialogue is always one of the greatest dramatic gifts from the playwright, and this is always present as he ignites both heartbreaking drama and sardonic comedy. He also writes indelible character studies, and these are fully fleshed characters who are never cheated by formula, predictability or false notes. MacMillan directs a cast that knows good material when they get it, starting with Megan Bellwoar’s heartbreaking, tour-de-force performance as Maureen, a high-wire calibration of layers of reality and delusions. The magical Charlie DelMarcelle is tender and quietly heroic as Pato, the practical and earnest suitor. Sean Lally is the only actor whose accent was a bit wily, but what a charming, electric performance. Lally has shown such range in a variety of classical roles recently. Without question, this is a towering performance by Mary Martello as Mag. Her transporting vocals, the layers of distress she exposes in her manipulations of Maureen and perhaps the most impressive component is her physical performance depicting a fragile monster of a mother. Every inch of the sometimes-challenging Lantern stage is used by set designer Dirk Durossette, the bent eaves with flocked-leaf wall breakaways, the stone structure and wooden door, the wood grey lacquered stove, the cobbled cabinetry, kept giving. McDonagh writes lengthy scenes, with intricate dialogue cycles and Macmillan lets this play breathe every moment.